Big changes are coming to the playground at Mount Vernon Community School on the corner of Mt Vernon Ave. and Uhler St. On any given day throughout the year, the space is teaming with children — kindergarten to 3rd grade students use it during the school year, and in the afternoons and weekends, countless families in the community hang out there, even those without kids at the school. But aside from the bright blue and green monkey bars, multiple slides and rounded passageways, the rest of the play area leaves much to be desired. On rainy days, the small field is a mud pit surrounded by trees with exposed roots, the picnic table area is frequently flooded and the unappealing chain link fence is often times littered with trash and weeds. At the end of the last school year, parents and community volunteers made the first attempt to spruce things up by redesigning the rock and tree garden, but now it’s time to take on the next phase — fixing the ongoing drainage issues and raising money to create an enriching, educational and fun place for kids to explore and play. 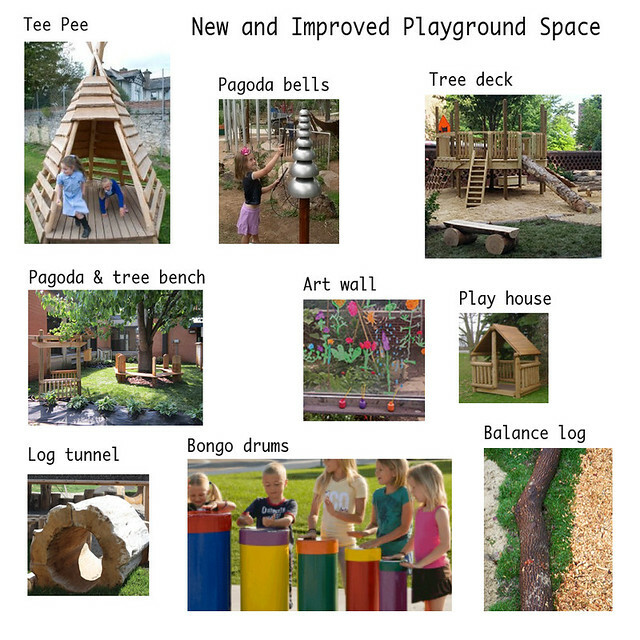 The school’s playground committee is developing a plan to improve the play area. 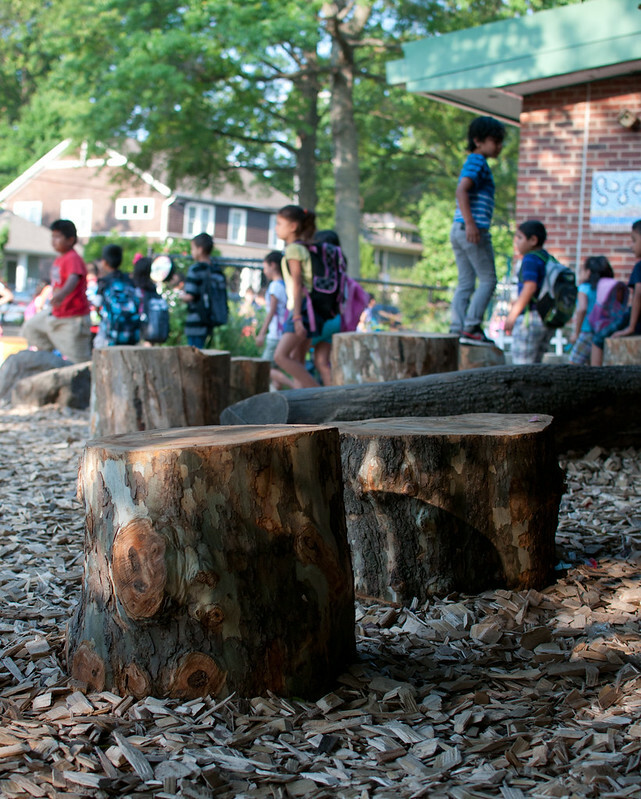 Every single item that they’ve chosen, as shown below, is designed to optimize child development, learning, health, imaginative play, social interaction, and exercise. The school is also working with the city to make infrastructure improvements, to fix rain and runoff issues, retaining walls, and fencing. 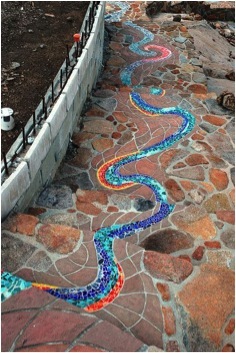 One ingenious solution is to work with the water flow that occurs naturally during a big rain. The committee wants to create a watershed discovery area there, with a intertwining path and mosaic creek bed. Here’s an example of one that the committee is using as inspiration while drawing up plans. They’re also making accessibility a priority in their planning so children of all abilities can enjoy the playground features. They’ll add ramps where necessary and ensure that children in wheelchairs and with limited mobility can move in between and around the playgrounds with rubber surfacing, as well as through entrances and walkways. 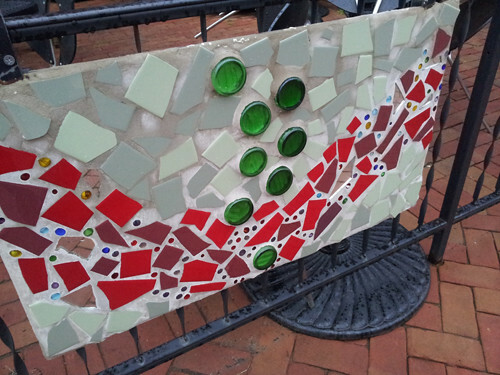 We featured Christi Hart’s mosaic designs in her home and around town. She’s helping to realize an idea for including mosaic panels along a long fence that runs the length of the playground along Mt. Vernon Avenue, where it will look fantastic to passersby. 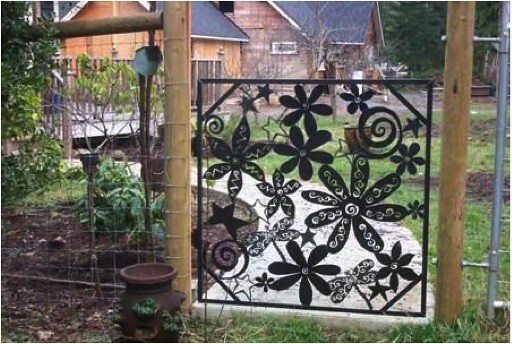 And, one day, the playground may also have inviting, artistic gates like this example. For this coming year, the playground committee is looking to raise money to start making a noticeable difference in the playground, which will surely benefit all of Del Ray who pass through with or without children. Want to support this endeavor? Part of the proceeds from the PTA’s annual Fabulous Fall Fundraiser this Saturday, November 1, 2014, from 6-9 p.m. will benefit the playground fund. Can’t attend the fundraiser? You can also make a donation to support the project. What awesome plans! Isn’t there any funding available from Big Flea proceeds? Maria, the main sources of funding for this project will be the Fall Fundraiser and Spring2Action. PTA also pays for field trips, enrichment programs,books, classroom supplies, and all kinds of other things in the school. The funds raised by the Big Flea along with funds from other ongoing fundraising efforts go to support all of those activities.